This is a repost that originally appeared on the Couchbase Blog: New Querying Features in Couchbase Server 5.5. New querying features figure prominently in the latest release of Couchbase Server 5.5. Check out the announcement and download the developer build for free right now. ANSI JOINs - N1QL in Couchbase already has JOIN, but now JOIN is more standards compliant and more flexible. All the examples in this post use the "travel-sample" bucket that comes with Couchbase. In Couchbase Server 5.5, it is no longer necessary to use ON KEYS, and so writing joins becomes much more natural and more in line with other SQL dialects. The only difference is the ON. Instead of ON KEYS, it’s now ON <field1> = <field2>. It’s more natural for those coming from a relational background (like myself). But that’s not all. Now you are no longer limited to joining just on document keys. Here’s an example of a JOIN on a city field. 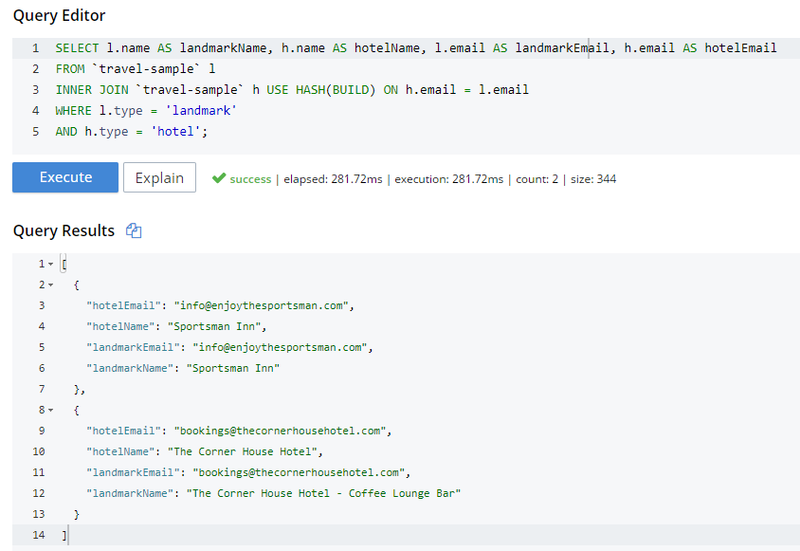 This query will show hotels that match airports based on their city. Note that for this to work, you must have an index created on the field that’s on the inner side of the JOIN. The "travel-sample" bucket already contains a predefined index on the city field. If I were to attempt it with other fields, I’d get an error message like "No index available for ANSI join term…​". For more information on ANSI JOIN, check out the full N1QL JOIN documentation. Note: The old JOIN, ON KEYS syntax will still work, so don’t worry about having to update your old code. Under the covers, there are different ways that joins can be carried out. If you run the query above, Couchbase will use a Nested Loop (NL) approach to execute the join. However, you can also instruct Couchbase to use a hash join instead. A hash join can sometimes be more performant than a nested loop. Additionally, a hash join isn’t dependent on an index. It is, however, dependent on the join being an equality join only. For instance, in "travel-sample", I could join landmarks to hotels on their email fields. This may not be the best find to find out if a hotel is a landmark, but since email is not indexed by default, it illustrates the point. The above query will take a very long time to run, and probably time out. Next I’ll try a hash join, which must be explicitly invoked with a USE HASH hint. A hash join has two sides: a BUILD and a PROBE. The BUILD side of the join will be used to create an in-memory hash table. The PROBE side will use that table to find matches and perform the join. Typically, this means you want the BUILD side to be used on the smaller of the two sets. However, you can only supply one hash hint, and only to the right side of the join. So if you specify BUILD on the right side, then you are implicitly using PROBE on the left side (and vice versa). So why did I use HASH(BUILD)? I know from using INFER and/or Bucket Insights that landmarks make up roughly 10% of the data, and hotels make up about 3%. Also, I know from just trying it out that HASH(BUILD) was slightly slower. But in either case, the query execution time was milliseconds. Turns out there are two hotel-landmark pairs with the same email address. USE HASH will tell Couchbase to attempt a hash join. If it cannot do so (or if you are using Couchbase Server Community Edition), it will fall back to a nested-loop. (By the way, you can explicitly specify nested-loop with the USE NL syntax, but currently there is no reason to do so). For more information, check out the HASH join areas of the documentation. Aggregations in the past have been tricky when it comes to performance. With Couchbase Server 5.5, aggregate pushdowns are now supported for SUM, COUNT, MIN, MAX, and AVG. In earlier versions of Couchbase, indexing was not used for statements involving GROUP BY. This could severely impact performance, because there is an extra "grouping" step that has to take place. In Couchbase Server 5.5, the index service can do the grouping/aggregation. Here’s an example query that finds the total number of hotels, and groups them by country, state, and city. Let’s take a look at the visual query plan (only available in Enterprise Edition, but you can view the raw Plan Text in Community Edition). It’s now taking ~7ms on my single node desktop. We’re taking ms, but with a large, more realistic data set, that is a huge difference in magnitude. The query plan is different. Note that this time, there is no 'group' step. All the work is being pushed down to the index service, which can use the ix_hotelregions index. It can use this index because my query is exactly matching the fields in the index. Index push down does not always happen: your query has to meet specific conditions. For more information, check out the GROUP BY and Aggregate Performance areas of the documentation. With Couchbase Server 5.5, N1QL includes even more standards-compliant syntax and becomes more performant than ever. Try out N1QL today. You can install Enterprise Edition or try out N1QL right in your browser. Have a question for me? I’m on Twitter @mgroves. You can also check out @N1QL on Twitter. The N1QL Forum is a good place to go if you have in-depth questions about N1QL.